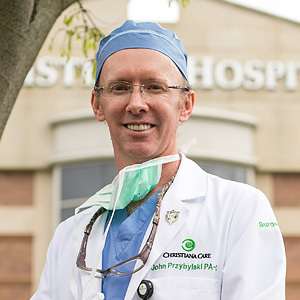 When John Przybylski graduated from high school, he wanted to pursue a career in the medical field. But life got in the way and he became a hair stylist and manager instead. His dream of medicine was not forgotten. He started a charitable program providing education about dealing with the outwardly visible signs of treatment to those with cancer. Finally, he decided it was time to put his dreams into action. He enrolled in classes at Delaware Tech to fulfill the prerequisites for Drexel University’s Hahnemann Physician Assistant program. Over the next four years, while continuing to work full-time, he attended Delaware Tech, maintaining 4.0 and earning a Campus Director’s Scholarship. While at Delaware Tech he formed many bonds with the faculty and staff at the school. “It was a great education, and the classes prepared me well for Drexel,” he says. John graduated with honors, passed the boards, and accepted a job at Christina Care Health System as a surgical physician assistant, the culmination of an eight-year journey that was made possible by the strong support of his family. John says he loves his career and feels like he is finally where he is supposed to be. Recently he assisted in a surgery for a woman who had battled breast cancer. She remembered him helping her with a wig in the salon where he worked more than a decade ago. “Sometimes there are just signs that tell you you’re in the right place at the right time,” he says.